Hiring? Toptal handpicks top C++ developers to suit your needs. Daniel has created high-performance applications in C++ for large companies such as Dreamworks. He also excels with C and ASM (x86). Bjarne Stroustrup’s The C++ Programming Language has a chapter titled “A Tour of C++: The Basics”—Standard C++. That chapter, in 2.2, mentions in half a page the compilation and linking process in C++. Compilation and linking are two very basic processes that happen all the time during C++ software development, but oddly enough, they aren’t well understood by many C++ developers. Why is C++ source code split into header and source files? How is each part seen by the compiler? How does that affect compilation and linking? There are many more questions like these that you may have thought about but have come to accept as convention. Whether you are designing a C++ application, implementing new features for it, trying to address bugs (especially certain strange bugs), or trying to make C and C++ code work together, knowing how compilation and linking works will save you a lot of time and make those tasks much more pleasant. In this article, you will learn exactly that. The article will explain how a C++ compiler works with some of the basic language constructs, answer some common questions that are related to their processes, and help you work around some related mistakes that developers often make in C++ development. The source files provided should be portable to other operating systems, although the Makefiles accompanying them for the automated build process should be portable only to Unix-like systems. Each C++ source file needs to be compiled into an object file. The object files resulting from the compilation of multiple source files are then linked into an executable, a shared library, or a static library (the last of these being just an archive of object files). C++ source files generally have the .cpp, .cxx or .cc extension suffixes. A C++ source file can include other files, known as header files, with the #include directive. Header files have extensions like .h, .hpp, or .hxx, or have no extension at all like in the C++ standard library and other libraries’ header files (like Qt). The extension doesn’t matter for the C++ preprocessor, which will literally replace the line containing the #include directive with the entire content of the included file. The first step that the compiler will do on a source file is run the preprocessor on it. Only source files are passed to the compiler (to preprocess and compile it). Header files aren’t passed to the compiler. Instead, they are included from source files. Each header file can be opened multiple times during the preprocessing phase of all source files, depending on how many source files include them, or how many other header files that are included from source files also include them (there can be many levels of indirection). Source files, on the other hand, are opened only once by the compiler (and preprocessor), when they are passed to it. For each C++ source file, the preprocessor will build a translation unit by inserting content in it when it finds an #include directive at the same time that it’ll be stripping code out of the source file and of the headers when it finds conditional compilation blocks whose directive evaluates to false. It’ll also do some other tasks like macro replacements. Once the preprocessor finishes creating that (sometimes huge) translation unit, the compiler starts the compilation phase and produces the object file. To obtain that translation unit (the preprocessed source code), the -E option can be passed to the g++ compiler, along with the -o option to specify the desired name of the preprocessed source file. It has 17,588 lines in my machine. You can also just run make on that directory and it’ll do those steps for you. We can see that the compiler must compile a much larger file than the simple source file that we see. This is because of the included headers. And in our example, we have included just one header. The translation unit becomes bigger and bigger as we keep including headers. This preprocess and compile process is similar for C language. It follows the C rules for compiling, and the way it includes header files and produces object code is nearly the same. Let’s see now the files in cpp-article/symbols/c-vs-cpp-names directory. No symbols are imported and two symbols are exported: sumF and sumI. Those symbols are exported as part of the .text segment (T), so they are function names, executable code. If other (both C or C++) source files want to call those functions, they need to declare them before calling. C language doesn’t know anything about the extern "C" directive, but C++ does, and it needs this directive applied to C function declarations. This is because C++ mangles function (and method) names because it supports function/method overloading, while C doesn’t. Those functions are exported (in my system) as _Z8printSumff for the float version and _Z8printSumii for the int version. Every function name in C++ is mangled unless declared as extern "C". 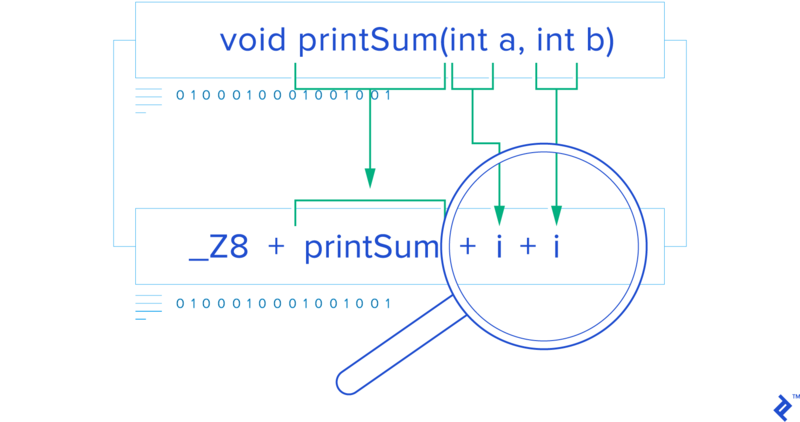 There are two functions that were declared with C linkage in print.cpp: printSumInt and printSumFloat. Therefore, they cannot be overloaded, or their exported names would be the same since they aren’t mangled. I had to differentiate them from each other by postfixing an Int or a Float to the end of their names. Since they are not mangled they can be called from C code, as we’ll soon see. With this option, instead of _Z8printSumff we see printSum(float, float), and instead of _ZSt4cout we see std::cout, which are more human-friendly names. We also see that our C++ code is calling C code: print.cpp is calling sumI and sumF, which are C functions declared as having C linkage in sum.h. This can be seen in the nm output of print.o above, that informs of some undefined (U) symbols: sumF, sumI and std::cout. Those undefined symbols are supposed to be provided in one of the object files (or libraries) that will be linked together with this object file output in the link phase. So far we have just compiled source code into object code, we haven’t yet linked. If we don’t link the object file that contains the definitions for those imported symbols together with this object file, the linker will stop with a “missing symbol” error. Note also that since print.cpp is a C++ source file, compiled with a C++ compiler (g++), all the code in it is compiled as C++ code. Functions with C linkage like printSumInt and printSumFloat are also C++ functions that can use C++ features. Only the names of the symbols are compatible with C, but the code is C++, which can be seen by the fact that both functions are calling an overloaded function (printSum), which couldn’t happen if printSumInt or printSumFloat were compiled in C.
And the linker won’t complain since that’s the exact name that my currently installed compiler invented for it, but I don’t know if it’ll work for your linker (if your compiler generates a different mangled name), or even for the next version of my linker. I don’t even know if the call will work as expected because of the existence of different calling conventions (how parameters are passed and return values are returned) that are compiler specific and may be different for C and C++ calls (especially for C++ functions that are member functions and receive the this pointer as a parameter). Your compiler can potentially use one calling convention for regular C++ functions and a different one if they are declared as having extern “C” linkage. So, cheating the compiler by saying that one function uses C calling convention while it actually uses C++ for it can deliver unexpected results if the conventions used for each happen to be different in your compiling toolchain. There are standard ways to mix C and C++ code and a standard way to call C++ overloaded functions from C is to wrap them in functions with C linkage as we did by wrapping printSum with printSumInt and printSumFloat. This will allow C++ code to call the overloaded function printSum or its wrappers printSumInt and printSumFloat. It exports main and imports printSumFloat and printSumInt, as expected. It exports main and imports C linkage printSumFloat and printSumInt, and both mangled versions of printSum. You may be wondering why the main symbol isn’t exported as a mangled symbol like main(int, char**) from this C++ source since it’s a C++ source file and it isn’t defined as extern "C". Well, main is a special implementation defined function and my implementation seems to have chosen to use C linkage for it no matter whether it’s defined in a C or C++ source file. So far, I’ve been careful not to include my headers twice, directly or indirectly, from the same source file. But since one header can include other headers, the same header can indirectly be included multiple times. And since header content is just inserted in the place from where it was included, it’s easy to end with duplicated declarations. See the example files in cpp-article/header-guards. The difference is that, in guarded.hpp, we surround the entire header in a conditional that will only be included if __GUARDED_HPP preprocessor macro isn’t defined. The first time that the preprocessor includes this file, it won’t be defined. But, since the macro is defined inside that guarded code, the next time it’s included (from the same source file, directly or indirectly), the preprocessor will see the lines between the #ifndef and the #endif and will discard all the code between them. Note that this process happens for every source file that we compile. It means that this header file can be included once and only once for each source file. The fact that it was included from one source file won’t prevent it to be included from a different source file when that source file is compiled. It’ll just prevent it to be included more than once from the same source file. For the sake of brevity, I won’t use guarded headers in this article if it isn’t necessary since most are short examples. But always guard your header files. Not your source files, which won’t be included from anywhere. Just header files. Since I use the using namespace std directive, I don’t have to qualify the names of symbols (functions or classes) inside the std namespace in the rest of the translation unit, which in my case is the rest of the source file. If this were a header file, I shouldn’t have inserted this directive because a header file is supposed to be included from multiple source files; this directive would bring to the global scope of each source file the entire std namespace from the point they include my header. Even headers included after mine in those files will have those symbols in scope. This can produce name clashes since they were not expecting this to happen. Therefore, don’t use this directive in headers. Only use it in source files if you want, and only after you included all headers. Note how some parameters are const. This means that they can’t be changed in the body of the function if we try to. It’d give a compilation error. Also, note that all the parameters in this source file are passed by value, not by reference (&) or by pointer (*). This means that the caller will make a copy of them and pass to the function. So, it doesn’t matter for the caller whether they are const or not, because if we modify them in the function body we’ll only be modifying the copy, not the original value the caller passed to the function. The signatures don’t express whether the copied parameters are const or not in the bodies of the function. It doesn’t matter. It mattered for the function definition only, to show at a glance to the reader of the function body whether those values will ever change. In the example, only half of the parameters are declared as const, so we can see the contrast, but if we want to be const-correct they should all have been declared so since none of them are modified in the function body (and they shouldn’t). Adding the const qualifiers here is allowed (you can even qualify as const variables that aren’t const in the definition and it’ll work), but this is not necessary and it’ll only make the declarations unnecessarily verbose. Note that I didn’t write the name of the variables in the declarations (in the header) as I’d been doing so far. This is also legal, for this example and for the previous ones. Variable names aren’t required in the declaration, since the caller doesn’t need to know how do you want to name your variable. But parameter names are generally desirable in declarations so the user can know at a glance what each parameter mean and therefore what to send in the call. Surprisingly, variable names aren’t either needed in the definition of a function. They are only needed if you actually use the parameter in the function. But if you never use it you can leave the parameter with the type but without the name. Why would a function declare a parameter that it’d never use? Sometimes functions (or methods) are just part of an interface, like a callback interface, which defines certain parameters that are passed to the observer. The observer must create a callback with all the parameters that the interface specifies since they’ll be all sent by the caller. But the observer may not be interested in all of them, so instead of receiving a compiler warning about an “unused parameter,” the function definition can just leave it without a name. // *a = 4; // Can't change. The value pointed to is const. // *b = 4; // Can't change. The value pointed to is const. // b = a; // Can't change where b points because the pointer itself is const. As you see, the nm tool uses the first notation (const after the type). Also, note that the only constness that is exported, and matters for the caller, is whether the function will modify the element pointed by the pointer or not. The constness of the pointer itself is irrelevant for the caller since the pointer itself is always passed as a copy. The function can only make its own copy of the pointer to point to somewhere else, which is irrelevant for the caller. Passing by pointer is like passing by reference. One difference is that when you pass by reference the caller is expected and assumed to have passed a valid element’s reference, not pointing to NULL or other invalid address, while a pointer could point to NULL for example. Pointers can be used instead of references when passing NULL has a special meaning. Since C++11 values can also be passed with move semantics. This topic will not be treated in this article but can be studied in other articles like Argument Passing in C++. Another related topic that won’t be covered here is how to call all those functions. If all those headers are included from a source file but are not called, the compilation and linkage will succeed. But if you want to call all functions, there will be some errors because some calls will be ambiguous. The compiler will be able to choose more than one version of sum for certain arguments, especially when choosing whether to pass by copy or by reference (or const reference). That analysis is out of the scope of this article. Let’s see, now, a real-life situation related to this subject where hard-to-find bugs can show up. There is one more counter in debug builds, as I explained earlier. I also created some helper files. The output isn’t as expected. increment1 function saw a release version of the Counters class, in which there are only two int member fields. So, it incremented the first field, thinking that it was m_counter1, and didn’t increment anything else since it knows nothing about the m_debugAllCounters field. I say that increment1 incremented the counter because the inc1 method in Counter is inline, so it was inlined in increment1 function body, not called from it. The compiler probably decided to inline it because the -O2 optimization level flag was used. So, m_counter1 was never incremented and m_debugAllCounters was incremented instead of it by mistake in increment1. That’s why we see 0 for m_counter1 but we still see 7 for m_debugAllCounters. Working in a project where we had tons of source files, grouped in many static libraries, it happened that some of those libraries were compiled without debugging options for std::vector, and others were compiled with those options. Probably at some point, all libraries were using the same flags, but as time passed, new libraries were added without taking those flags into consideration (they weren’t default flags, they had been added by hand). We used an IDE to compile, so to see the flags for each library, you had to dig into tabs and windows, having different (and multiple) flags for different compilation modes (release, debug, profile…), so it was even harder to note that the flags weren’t consistent. This caused that in the rare occasions when an object file, compiled with one set of flags, passed a std::vector to an object file compiled with a different set of flags, which did certain operations on that vector, the application crashed. Imagine that it wasn’t easy to debug since the crash was reported to happen in the release version, and it didn’t happen in the debug version (at least not in the same situations that were reported). The debugger also did crazy things because it was debugging very optimized code. The crashes were happening in correct and trivial code. In this article, you have learned about some of the basic language constructs of C++ and how the compiler works with them, starting from the processing stage to the linking stage. Knowing how it works can help you look at the whole process differently and give you more insight into these processes that we take for granted in C++ development. From a three-step compilation process to mangling of function names and producing different function signatures in different situations, the compiler does a lot of work to offer the power of C++ as a compiled programming language. I hope you will find the knowledge from this article useful in your C++ projects. Daniel has a proven talent for creating high performance applications in C++ for large companies such as Dreamworks Animation SKG. He has developed C++ applications with the Intel Threading Building Blocks framework, Boost C++ libraries, and Qt libraries. He also excels with C and ASM (x86). Interesting article - thanks! Your debug/release issue - is one where that's always a worry. If someone recompiles a library or object file in the wrong release/debug mode. One soultuion although not fool proof is name debug libraries with a _d after the main name mylibary_d //debug mylibary //release It would be nice to have a warning or error thrown if the linker can detect a debug and release mismatch! Perhaps compiler when name mangling to add a _DEBUG to the names? Just a small comment to guards - I personally prefer #pragma once, which work on most modern systems, and on large projects significantly improves compilation times. Also, I miss a note about precompiled headers, which is another great time saver. It really makes a difference to recompile 10 minutes instead of 16 minutes 8 times a day. This is much broader topic - DEBUG versions are out of scope of compilers; they are related to your build system. E.g. cmake allows you to define build types very easily and you can easily name the library based on the build type, as well as include the right version of the library in the right build of the final executables. Yes, both comments are correct. Good topics. what books do you recommend for upgrades about C++?? Why do you use '#ifndef NDEBUG' over '#ifdef DEBUG'? The former reads as 'if not debug is not defined', whereas the latter reads as 'if debug is defined'. very good article! clear enough!